Ramadan & Eid al Fitr Trail Mix – Hello Holy Days! One of the best things about having colours associated with a holiday is that you can put together festive ideas so easily. A trail mix is always a crowd pleaser at any party so for a Ramadan or Eid al Fitr party, make a purple and gold themed trail mix! 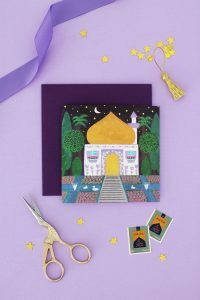 (For more info on Ramadan and Eid al Fitr’s colours, please see here.) Display your trail mix on a purple table runner and scatter gold star confetti all around the table runner for a festive set up! Separate purple and yellow coloured smarties from the rest of the smarties. Toss the chex mix, popcorn, pretzels and smarties into a bag and shake well. Transfer to a bowl. Top with star shaped sprinkles and serve.